Vector graphics are stored with mathematical formulas to produce clean, smooth, and appealing graphics for high quality prints (Example Above on the Right Side). Contrary, image files like .JPG and .PNG are stored in pixels (Example Above on the Left Side). When it comes to great quality custom cycling jersey prints, the difference can be striking! For print, media, and custom cycling jerseys, Vector files are the absolute best format. Why is this you may ask? Usually, a logo or custom cycling jersey graphic is created in a vector based program such as Adobe Illustrator. Because the graphic itself is stored in terms of mathematical formulas, these formulas can be edited in any such way, including color, size, layers, etc. and does not include any background color! This is ideal for incorporating graphics into your new stunning custom cycling jersey design. These Vector files can be handed off to any design professional and be turned into a masterpiece. Where can I get my Vector Graphic files? 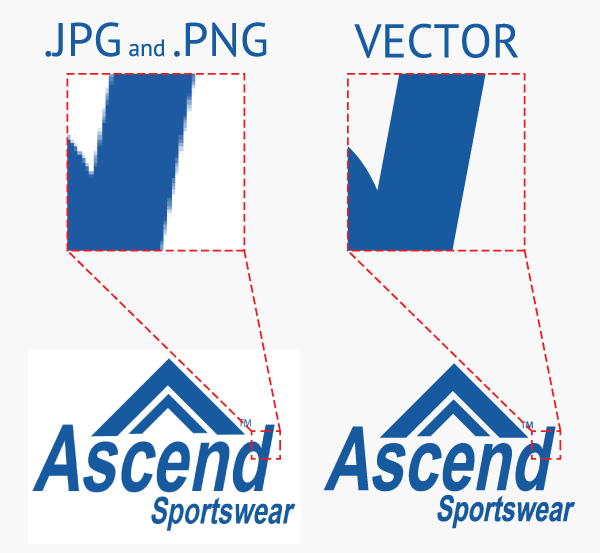 When working with a printer, promotional products vendor, or Ascend Sportswear on your custom cycling jerseys they will most likely ask for or require your logo in VECTOR file types. If you don’t have this file type you will need request it from the graphic designer or professional that created the original artwork/graphic. If that person is not available then speak to your custom apparel specialist to see if your logos can be converted with us! What file extensions do Vector Graphics come in? What file extensions are NOT Vector Graphics? The above file formats are not editable or scalable. Altering one of these files will have a detrimental effect on the quality of the finished product. As you can see from the examples above, there is no loss in quality when you scale a Vector graphic. If you have ever attempted to scale an image file, you have probably experienced the blurry, distorted, or pixelated result yourself!